Is shoulder blade pain stopping you from improving your posture, doing your exercise program, or keeping you from your regular activities? Today’s blog is about shoulder blade pain, what causes shoulder blade pain, and actions you can take to relieve your pain so that you can get back to doing the things you love to do. How Long Will It Take to Fix the Pain? Before I start I need to make several important statements. First, the self care instructions I provide in this article address most instances of shoulder blade pain, however, I encourage you to visit a licensed health professional such as a Physical Therapist (or Physiotherapist, depending on where you live). A skilled health professional is in a better position than you to quickly identify the source of your shoulder blade pain and recommend an effective solution. Second, if you are unable to get rid of your shoulder blade pain within a week or two of doing self-care on your shoulders, seek the advice of a healthcare professional such as your Physician or Physical Therapist. There are many causes for shoulder blade pain (that are not identified in this blog article). For example, shoulder blade pain can be referred from your organs or from a compression fracture if you have osteoporosis. These can be serious and require the attention of a skilled health professional. If you have any doubt that the origin of your pain indicates a serious health issue, you should seek the advice of a skilled health professional. Having said that, most of the shoulder blade pain that I see with my patients is simply from people not looking after their shoulders or keeping their muscles healthy and happy. Before getting into the causes and fixes for shoulder blade pain, I suggest you learn a bit about shoulder anatomy. That is covered in the next section. Feel free to skip this section if you already feel comfortable with shoulder anatomy. Physical Therapist, Marjorie Gingras, specializes in treating clients with shoulder issues, including shoulder blade pain. 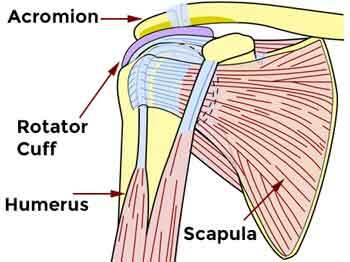 In this video, Marjorie delivers an excellent introduction to shoulder anatomy. Marjorie does a great job explaining not only how the shoulder anatomy works, she shows how poor posture and poor movement patterns can cause shoulder blade pain. Upper arm bone or humerus. Movement within the shoulder is made by muscle. In fact, fourteen muscles alone are involved in lifting your arm! Each of these muscles can be a source of shoulder blade pain if you do not practice safe movements or compromise your posture. When you lift your arm, you use the muscle on the shoulder and the rotator cuff muscle. The tendons that pass through the space between the bony part called the acromion and the head of the humerus can get squeezed and cause shoulder blade pain. When you reach up or out for something and you have a rounded shoulder (forward head posture). When you lift your arm up and have your palms facing down. You see this often in the gym when people lift weights. The shoulder blade pain will likely not happen the first time you do either of these, or even the second time, but eventually it’s going to hurt some point point in time if you keep up either of these habits. Over time tendon tears, from partial to complete, can occur. Be attentive to your posture. Fix your rounded shoulder or forward head posture. Instead of lifting objects or reaching for things with your palms face down, keep your thumb up when you are lifting weights or reaching up. There can be a number of causes of shoulder blade pain. It is important to initially figure out where you feel the pain and the possible source. This information can help determine the cause. Patients with shoulder blade pain tell me that they either feel pain between their shoulder blades or they feel that it is coming from under the shoulder blade. At times, I give a client an exercise program for osteoporosis or another medical condition and they tell me that certain exercises cause them shoulder blade pain. When we review their exercise program, it turns out that the cause of the shoulder pain is the not the exercise program itself but something else that they are doing. Let’s look at these seven frequent causes of shoulder blade pain in more detail, starting with how you sleep. Poor posture before bedtime can aggravate shoulder blade pain. Are you attentive to your posture when you look at TV or read a book the hours leading up to bedtime? Equally, a poor posture in bed and before you nod off can be a source of the pain. Do you read in bed? If so, what was your position while you are lying in bed getting ready to fall asleep? Incorrectly positioning your shoulders vis-à-vis your pillows. Tucking your shoulder underneath you. Tucking your arm underneath your head. I have a series of short videos on proper sleep position so you can better understand this issue. The first one, below, covers how a side sleeper can set up their pillows and bed to avoid neck and shoulder blade pain. Think about your sleeping position. Review the videos above on proper sleeping positions to see if you are compromising your shoulder position. What you were doing in the last few hours of the day? Were you attentive to your posture? Try modifying one thing at a time from the list above and see if that addresses your shoulder blade pain. The second possible cause of shoulder blade pain could be how ergonomics affects your daily posture habits. A Physical Therapist cannot undo what you do all day long to your shoulder. We can only encourage you to think about what is it that you are doing all day long that could be causing shoulder blade pain. Once we identify the probable source, we can show you how to modify your harmful habits. For example, are you spending your day at a computer without elbow support or proper ergonomic alignment? These positions can put your shoulder at a mechanical disadvantage and cause shoulder blade pain. Consider an ergonomic assessment for your workstation and make appropriate modifications. Be attentive to your posture when you use your computer or your smart phone, or when you spend hours at an activity such as knitting or reading. These activities, when done over a prolonged period, can have a significant effect on your shoulder and cause postural stresses on the shoulder joint. Reduce the incidence of shoulder pain by keeping your elbows by your side when using your keyboard. A pillow under your arms will take stress off your shoulders when reading or knitting. The third possible cause of shoulder blade pain could be the effect of a sling, brace or cast on your alignment. If you are or have been wearing a cast, sling or brace because of an injury to your shoulder or surrounding area, it can change how you move and hold yourself. Eventually these movements and body positions can cause trigger points or tender spots to appear in our muscles and lead to shoulder blade pain. An old injury such as a rotator cuff tear, neck injury, or deep tissue injury can be the eventual cause of shoulder blade pain and discomfort. Acute injuries to the rotator cuff or upper back will certainly be felt in the shoulders. Consider trigger point or massage therapy to isolate and reduce the shoulder blade pain. Pay attention to your alignment and try to get back to perfect posture once your brace, cast or sling has been removed. The fourth possible cause of shoulder blade pain could be because of the way you are built. Many of the things we interact with on a daily basis, (for example, chairs, airplane seats, car seats, ATM machines) are designed for people with a specific physical build. Some of us have arm and leg lengths that differ considerably from this standard. You might have arms shorter than the standard arm length. 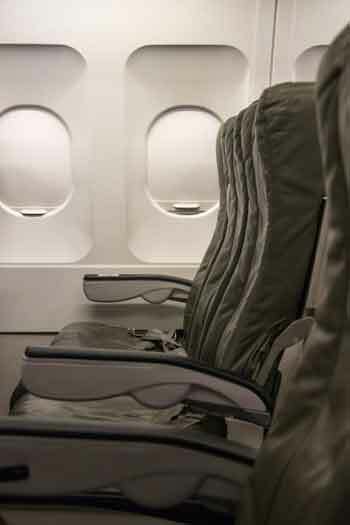 That could be a noticeable disadvantage in today’s world with, for example, armrests in cars or airplanes designed to accommodate the average person. If your upper arm doesn’t fit into an average length, then armrests will be a little bit too low for you all the time. The same problem can occur with chairs in public spaces. If you do not modify how you interact with standard size items, you could compromise your posture and, over time, this could lead to shoulder blade pain. The onus is on you to accommodate that difference. Strap pieces of foam on to your work chair so that your arm does not hang down while you work and compromise your posture. Set your car seat (and specifically the armrests) such that you maintain proper postural alignment while driving. Use something like a rolled sleeping bag as an armrest to relax your shoulders on long drives or plane rides. The fifth possible cause of shoulder blade pain could be a sedentary lifestyle. Muscles love to move. The shoulder is especially sensitive to regular movement and is a remarkable joint that allows us so many ranges of motion. It enables external rotation, internal rotation, flexion, extension, adduction, and horizontal adduction. Many of us go through our day-to-day life, however, settled into a very limited and repeated motion pattern. We probably do not do many of the movements and activities that we did on a regular basis when we were younger and active. I often ask my clients, “When was the last time you raised your arms up overhead?” Sadly, many cannot recall. Make sure that you bring those shoulders into the full range of motion that the anatomy provides. These include the motion of the shoulder blades which involve not just coming forward and back, but going up and down. The shoulder girdle (or the scapula) enables a wonderful range of motions. Make sure that when you do move the arm, that the shoulder girdle (or scapula) moves with it. Try to do this on a regular basis. In this video, Physical Therapist and shoulder specialist, Marjorie Gingras, demonstrates how to get your shoulder blade moving with the scapula engaged. ﻿ Marjorie explains and demonstrates how your shoulder works and the importance of stability. She shows that you need to fully engage your shoulder. If you keep your shoulder down, this can lead to shoulder blade pain. Of all these systems of the shoulder anatomy, the clavicle’s connection to the sternum is the only link with the rest of the skeleton and this connection does not provide a lot of stability. Motion of the shoulder is delivered by the muscle of the shoulder blade moving up or down. The humerus is supposed to stay stable on this mobile surface. Your humeral head is supposed to stay the middle of this little surface — like a a golf ball on a tee. One of the most important things you can do to avoid shoulder blade pain is to keep the humeral head centered on the surface — whatever you do with your shoulder, with or without weights. You often see many people keep their shoulder blade down when they reach up — for example in ballet, yoga, or pilates. This is problematic and can cause shoulder blade pain. 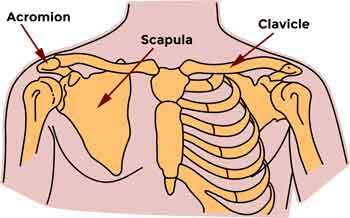 Instead, Marjorie recommends that you engage your scapula (shoulder blade) when you reach up our out. The best way to move your shoulder (when you reach for the cupboard or comb your hair) is to bring your arm up and then let the shoulder blade go up (as demonstrated by Marjorie in the video). The sixth possible cause of shoulder blade pain could be a physical impairment or external constraint that is affecting your shoulder. Are there things that you are using on or around the muscles of the shoulders that could be causing you shoulder blade pain? For example, women who are large-breasted have to wear bras that are so tight that the straps sink into their upper trapezius. For some people it’s bras, for other people it could be the backpack that they wear. Their backpack might not have the chest tie strap or the waist belt that helps to take the weight off of the shoulders. Tight bras and backpacks can restrict blood flow to the muscles. The restriction can be very subtle but trigger points can cause eventual pain in the shoulder blade area. Heavy purses can also be a cause of shoulder blade pain. Many women I see for Physical Therapy show up at my clinic carrying a heavy purse. They tell me they hardly have anything in the purse but somehow that purse ends up weighing four and five pounds! How can that happen? Frequently, they carry the purse over the same shoulder, day in, day out. Even if they do a cross pattern carry (with the strap going across their torso), the purse is still too much weight carried through the shoulder. A heavy purse can constrict the blood flow to the muscles, alter your postural alignment and lead to shoulder blade pain. Men have their own challenges. Those that wear ties for work and formal occasions should be attentive to how tight they tie their ties. Ties that are tight around the scalene and the sternocleidomastoid muscles in the neck can create trigger points that go as far back as the lower shoulder blades and the space between the spine and the shoulder blade. Consider the compounding effects of day-to-day life, physical impositions, constraints or impairments and the forces that you could be placing on your shoulder without realizing it. Have a professional bra-fitting and request wider straps or different styles of straps so that the line of compression is changed from day to day. A client referred me to LeUnique Bras for custom fitted bras. Use a chest strap for your backpack. The seventh possible cause of shoulder blade pain could be that you carry your poor posture and movement patterns from your work and activities into your exercise program. As mentioned earlier, a sedentary lifestyle can lead to shoulder pain. On the other extreme, some people are very active and move a lot, but in the same pattern all the time. A habitual exercise pattern of movement can be problematic. People often gravitate towards the things that they are good at and that they find easiest to do. This is a natural behaviour, but you should resist. Here is an example. In my past life, I had a golf fitness practice. I found that a lot of golfers would set up their golf shot with the same slouching posture they held all day long. If they were sitting behind their computer with a forward shoulder posture at work, they would carry the same rounded shoulder and forward head posture into their golf swing at tee time. It felt comfortable and became habitual. Instead, they should have spent their time before the golf game opening things up and realigning so that they get a better swing. This repeated forwardness compounds over time and has a significant affect on the health of your shoulders and potentially leads to shoulder blade pain. Finally, look at the video earlier in this article by Physical Therapist Marjorie Gingras on how to avoid shoulder pain and injuries. She explains how both posture and poor movement patterns can squeeze your tendons around the rotator cuff area and cause shoulder blade pain. When I work directly with my clients, I note their patterns as they go through their exercise program. I correct their posture and movements so that they are not carrying their poor posture into their exercise program. Consider the same when you exercise. Work with an experienced and knowledgeable health professional, such as Physical Therapist comfortable with exercise, who can watch you exercise and correct your movement patterns. Follow the advice of my colleague, Physical Therapist and shoulder specialist Marjorie Gingras, and move your shoulder with a thumbs-up movement pattern. This avoids the tendon squeeze which can lead to considerable shoulder blade pain. In this short video, Physical Therapist and shoulder specialist, Marjorie Gingras, demonstrates how to avoid shoulder blade pain after push ups. You could experience shoulder blade pain after push ups that involve lowering you body too low and too close to the surface. This causes the shoulder to glide in front. Instead, you want to keep a limit your arm movement and stay parallel to the surface. Do not go lower than that. You also want to maintain shoulder blade stability during the push up. When you go too deep into your push up, the shoulder blades get pushed into the middle of the back and stay there. Instead, when you start your push up, keep a good contraction with your shoulder blades apart. When you go deep, the shoulder blades move, but do not have them glide all the way together and feel a pinch of skin between them. Maintain proper alignment during the push up and avoid shoulder blade pain. Stop the stoop — how to avoid kyphosis. How Do These Causes Lead to Shoulder Blade Pain? Each of the causes listed above lead to shoulder blade pain because certain muscles in the shoulder and back area get longer and weaker. At the same time, other muscles in the chest and neck get shorter and tighter. Forward head posture or pocket chin (chicken neck) posture. Shoulder blades sitting too far apart. The average distance form tip to tip is approximately three inches for an mid-size adult. Increased thoracic kyphosis or hunchback. Arms rounded inwards (also known as an orangutan posture). Any or all of these postural changes can lead to shoulder blade pain. If we simply treat the affected muscles listed above, we are not going to address the underlying cause of the pain or help you get rid of or relieve shoulder blade pain. We need to do more. The last thing I want you to do is give it up on your exercise program because of shoulder blade pain. Instead, I hope this blog post helps you to consider what might be happening when you perform a specific exercise. Do you have your posture in a forward flexion position all long at work or as you carry out your activities? Do you carry this posture (and the shoulder blade position) into your exercise program, whether that is a weight bearing workout in the gym or a group cardiovascular class? 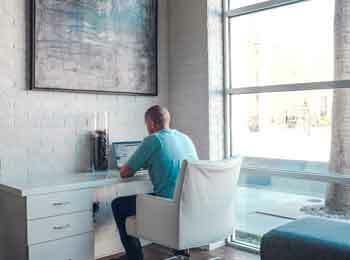 If the answer is yes to either of these questions, I encourage them to change how they sit at their desk during your work hours so that when they go into the gym or attend their exercise class, they are not taking that forward posture in with them. Second, I ask clients who complain about shoulder blade pain to feel the muscles through their shoulders, neck and upper back and look for tender spots. Between your shoulder blades and your spine. On the shoulder blade itself. Usually only one shoulder will bother us at a time. This allows you to compare your good side to your tender side to gauge the shoulder blade pain level. Once you identify and isolate the pain points, do some self-massage. They have a great section at the beginning of the book that identifies where pain is referred to. For example, even as Physical Therapists we sometimes forget that the scalene muscles in the neck can be the source for a nagging pain in at the lower angle of your shoulder blade. Explore all the places that can cause the shoulder blade pain. The pain can come from any number of areas and be referred to the shoulder blade area. 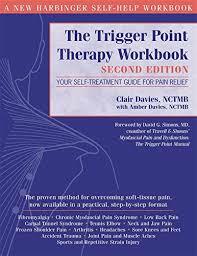 All of those little details are covered in this book with great diagrams and descriptions on how find and treat pain. Finally, if necessary I prescribe appropriate postural exercises that help them regain their perfect posture. My book, Exercise for Better Bones, has a section dedicated to posture building exercises. The exercises are categorized by either strengthening and stretching postural exercises. Here are two exercises I recommend to relieve shoulder blade pain. This posture exercise is designed to stretch your muscles and help loosen those muscles that get tight and short because of poor posture. You should feel this work your chest and upper arms. Lie on your back with your hands resting over your ears, elbows pointing to the ceiling, and your knees bent. Press your elbows downward and outward into the floor. Keep the small of your back a hand-width from the floor. Hold for one to two seconds. Be mindful to keep your neck in a lengthened position. If the back of your arms do not touch the floor, place a folded towel(s) or pillow(s) by your side so that you have something to push against. Over time, you should gradually reduce the support (towel or pillow) until you can get your arms to touch the floor. You can also do this exercise standing up against the wall or sitting tall in a chair if you find getting on the floor to be too much of a challenge. This posture exercise is designed to strengthen muscles and improve your posture so that you can relieve shoulder blade pain. The muscles targeted by this exercise include the rotator cuff (back of the shoulder blade) and the rhomboids (deep muscle of the upper back). It also improves bone strength in the spine. Lie on your back in your best postural alignment or sitting tall or standing tall. Loop a band, the width of the shoulders, around your wrists. Bend elbows at a right angle. Slide your shoulder blades downward and together. Draw your elbows into your side and press outwards through your wrist. Hold for two to three seconds. You should feel very little motion while experiencing maximum efforts. Think of your elbows as pivots. If you do not have a loop band, a belt, rope or heavy TheraBand will works. How Long Will It Take to Fix Shoulder Blade Pain? The cause of the pain. How longstanding it has been. The frequency and intensity of the intervention. Thank you for tuning in and I wish you many, many years of happy, flexible, mobile and pain free shoulders. I have a page dedicated to Perfect Posture. You can find information on how to get that perfect posture. For those of you interested in dedicated Physiotherapy, I also offer one-on-one Physical Therapy postural alignment through my Posture Alignment Therapy.